Fletcher Access was established 20 years ago by brothers Simon and Anthony Fletcher, and operates throughout the Midlands and South West. It undertakes a range of overhead assignments at heights of up to 42 metres, including tree work, roof maintenance, and cleaning, while also offering a range of powered access equipment for hire. The largest and most powerful of the Mercedes-Benz implement carriers, the U530 pairs a fuel-efficient 7.7-litre six-cylinder engine producing 220 kW (299 hp), with a fully synchronised, electro-pneumatic transmission that has eight forward and six reverse gears –the optional working gear range provides another eight forward and eight reverse gears. Permanent all-wheel drive, impressive ground clearance, and uprated portal axles which have differential locks and offer extreme levels of articulation, all contribute to the truck’s unrivalled cross-country capability, yet it will also cruise happily at 56 mph on the road. Options specified by Fletcher Access include unique Central Tyre Inflation (CTI) technology, and the Vario Pilot System. CTI enables the driver quickly and easily, and without leaving their cab, to lower tyre pressures, thereby improving traction and minimising damage to particularly soft ground. Vario Pilot allows them to switch the steering wheel to the other side of the vehicle in around 30 seconds. Other non-standard features include air conditioning, air-suspended driver and passenger seats, and front and rear cameras with monitor. The Unimog came with a factory-fitted Scattolini tipping body for which Bodycraft, of Worcester, fabricated a high-sided box with lockable rear doors. Using a front-mounted wood chipper driven by the truck’s PTO, Fletcher Access can load chippings through four ‘doors’ in the roof. The operator also employs the truck to carry up to four baffled, 1,000-litre (one tonne) demountable tanks of rain water, which it harvests and purifies at its base, together with the power washers, ground protection boards, and other equipment it uses for high-reach cleaning services. The fact that the GRP body is insulated helps to prevent the water from freezing when temperatures drop. A VBG drawbar coupling, meanwhile, allows the Unimog to tow Fletcher Access’s tandem-axle trailer at a gross combination weight of up to 26 tonnes. The trailer transports the company’s tracked access platforms, the biggest of which has a 42-metre reach and tips the scales at seven tonnes. The Unimog may be new, but the operator was already familiar with Mercedes-Benz vehicles. The U530 has replaced the 7.5-tonne Atego truck with hydraulic boom lift which Fletcher Access relied on previously to tow its trailer, as well as a pair of Sprinter vans, each of which carried a single, 1,000-litre tank of water. Simon Fletcher recalled: “The Atego was due for replacement so having long favoured Mercedes-Benz vehicles for their reliability and longevity, we considered various options with Rygor Fleet Sales Manager Jeremy Price, from whom we’ve acquired all our vehicles over the years. A visit to a Mercedes-Benz Unimog Live event confirmed the vehicle’s potential, and the brothers decided to go ahead. 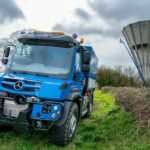 “With Jeremy’s help and expert advice we were able to specify the Unimog perfectly to meet the needs of our various operations,” continued Simon Fletcher. Anthony Fletcher is the vehicle’s principal driver. He said: “You sit high up in the Unimog and have an excellent view of what’s around you. In terms of its footprint it’s not a lot bigger than the 5.0-tonne Sprinter van we’ve retained, yet it can carry so much more. “The truck’s all-terrain capability is an obvious benefit – we regularly deliver our machines down narrow lanes, where its all-wheel drive system means we’ll never get stuck on a verge or the edge of a field. The Unimog is being inspected and maintained under a Mercedes-Benz Complete Service Contract, by the workshop team at Rygor’s Kidderminster branch. Jeremy Price added: “Our consultancy-style sales approach and commitment to Setting Standards means we’ll do whatever it takes to ensure that every vehicle we supply is tailored to meet the precise needs of the customer.